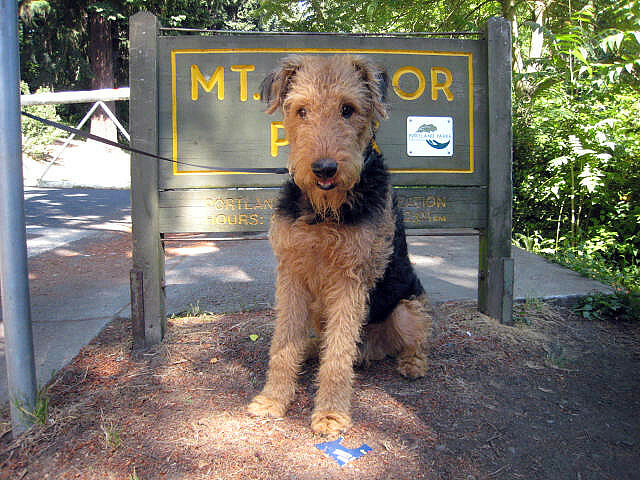 Airedale Terriers are called the “King of the Terriers” for their large size, and they’re also super smart. Find out more in our breed profile. The dog called the “King of Terriers” is the largest terrier of them all. Airedales are active and loyal companions with double coat colors of tan and either black or grizzle markings. Their average life expectancy is around 12 years, though some may live longer. The breed has V-shaped ears and small, dark eyes. Average weight is around 55 pounds for males and 45 pounds for females, with height averages around 23 inches. The original terriers that led to the Airedale breed were called Working, Waterside and Bingley terriers in the valley of Aire in England in the middle to late 1800s. The original dogs looked different from the Airedale we know today. The breed was crossed with an otterhound to improve their scent and swimming abilities. Airedales were used in police duty in Germany and Great Britain, and the breed also served in both world wars on guarding and dispatch duty. The original terriers were used in hunting birds and game as well as to control the rodent population. The AKC recognized Airedales in 1888. John Wayne acquired his nickname The Duke after his Airedale Terrier Little Duke. Presidents Woodrow Wilson and Calvin Coolidge both had Airedale Terriers. Author John Steinbeck, who wrote Of Mice and Men and The Grapes of Wrath, had one too. Today’s Airedales participate in guarding, hunting, tracking, competitive obedience, agility, conformation and therapy. They are also companion pets. Airedales are sweet but courageous canines that are very active. They can be too active for young children at times. They adjust to new situations and environments easily and can be protective. 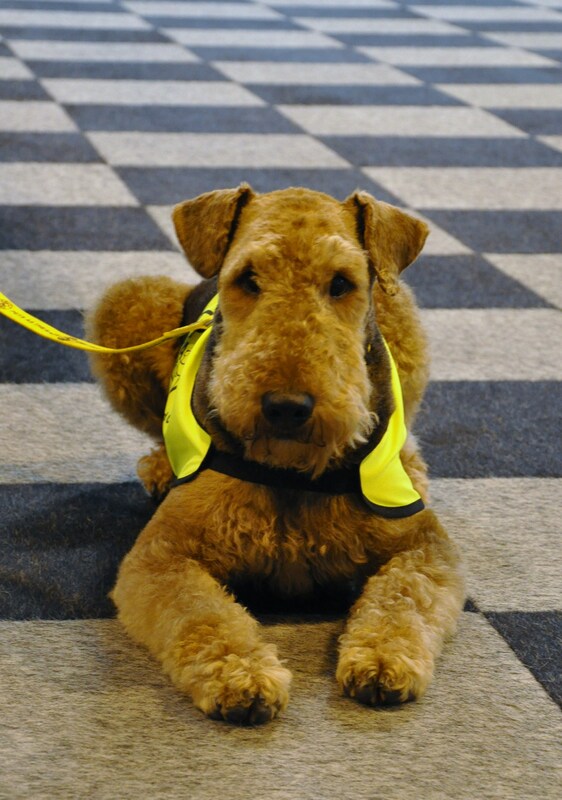 Airedales are intelligent and must be trained, although a variety of training techniques can help keep their boredom at bay. This breed is good with other animals but may show a tendency to dominate other dogs; socialization is recommended. They need regular exercise and play. They do make excellent family pets and are loyal to family members. Although Airedales are known to be playful and friendly, they are fearless and determined if challenged. This active breed requires daily exercise. A medium-sized yard is ideal, and daily walks are strongly recommended. Apartment life is not ideal for Airedales unless you can commit to providing outings and exercise. A lack of exercise can lead this breed to boredom, stubbornness or mischief. The dogs typically have a high energy level in the first few years that may taper off as they mature. Airedales need regular, daily brushing and excess hair trimmed from the paws. Professional grooming three to four times per year is required for conformation and recommended for allergy sufferers. Check and clean the facial hair daily as food and debris can accumulate. Regular maintenance of nail trimming and teeth cleaning is recommended. If Airedales are kept in warm climates, you should strip their coats regularly. Airedales are a healthy breed. They typically experience only a small list of common ailments that include hip dysplasia, skin infections and eye problems. Is the Airedale Terrier Right for You? Airedale Terriers are adorable dogs that might remind you of an elongated teddy bear face, but don’t let the cuteness fool you. These dogs need someone committed to harnessing their energy with daily walks and play. They are great for families but may be a bit boisterous around children. They are good with other animals but need to be socialized. They are not recommended for apartment life unless you can commit to daily outings to allow them to burn off energy. They are loyal and affectionate dogs that can be trained, but the training needs to be consistent. If you can fulfill these requirements, you might just be the perfect home for an Airedale Terrier. Please turn first to adoption resources. Check out the Petful adoptable pets page. You can also check with rescue groups and breeders.